If you read quilting blogs much, you will likely have seen traces of this 'Around the World Blog Hop'. If you're tagged, you write a blog post answering the questions and then tag three more bloggers. I don't generally participate, simply because these blog hops remind me just a bit of those chain letters of my childhood days. Those terrible chain letters which I dreaded receiving! They always gave me sweaty palms and a nagging feeling. Like I felt responsible to give 6 sheets of stickers to the girl who gave me the letter, but never passed the letter on to 6 more people and still felt slightly guilty for that! I remember when I found out by reading somewhere that chain letters were discouraged and possibly even illegal?... ok I don't know if they were/are illegal, but anyways, I felt such a weight lifted off of me. Like all those chains that I bombed out on were erased from my list of former sins! Well, that was straying from the topic, but really this blog hop is quite different from a chain letter and when I read the questions and answers on other blogs, I felt like it was a fun hop to join! First of all, I'd like to mention the sweet girl who nominated me. 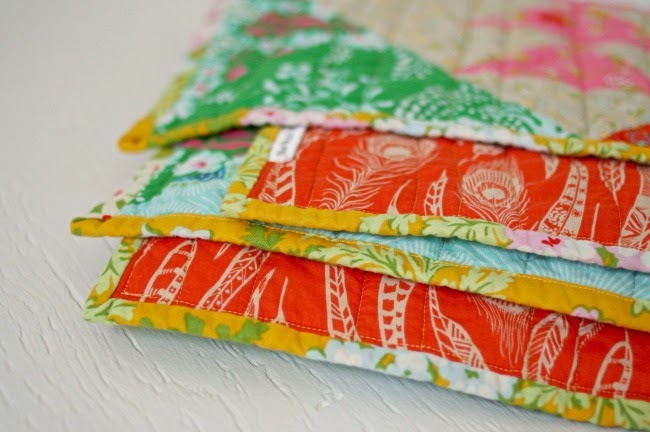 Annie of anniemacoriginal is a Canadian girl living in Italy, and making quilts of course! 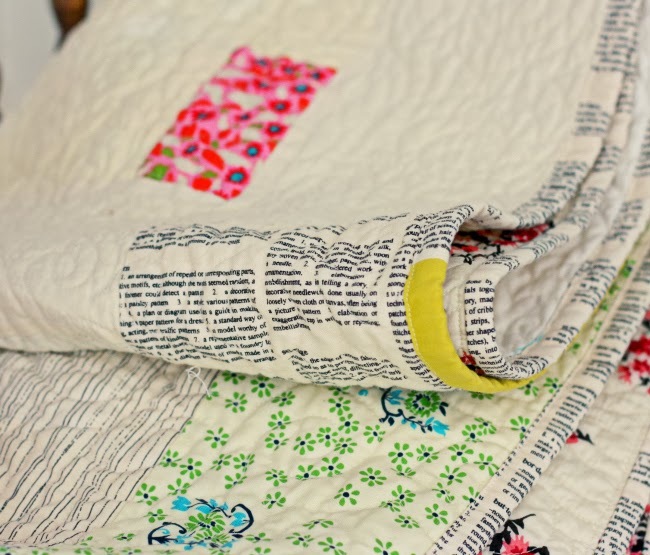 I love this voile quilt she made for her bed, isn't it luxurious?! I'm too lazy to take photos of all my in progress piles... If you read my blog regularly you may have caught on that I've got myself a sweet little 6 week old baby. This means that I walk a small radius between rocking chair, crib, and kitchen,. It stands to reason that if my sewing machine was somehow placed within this radius, I'd escape any feelings of claustrophobia by cutting a strip here or sewing a seam there. So my sewing machine has been moved to the dining room table, a long stairway and walk away from all my fabric and design wall, as well as all my other projects in process. So a new location would mean I should start a whole new set of projects, right?! I know, I don't like the mental clutter either... but I can't help it! So I'm sewing myself a dress out of this fabric , because my other clothes don't fit ! I finished up a simple little baby quilt which you can glimpse in the top photo. Just finished the quilt top for this bundle, and am trying to decide on backing and binding fabric. Do I try to calm it down with a neutral or solid? Or amp up the crazy with a purple print? 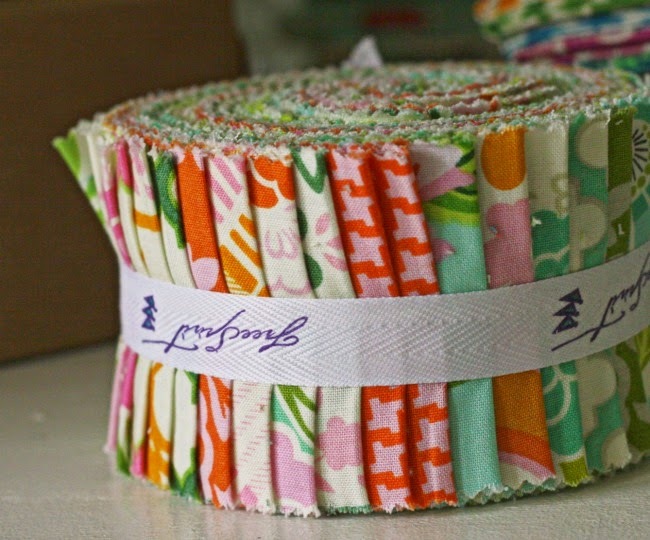 Bought a jelly roll of Up Parasol and am currently sewing half of it into a little girl quilt and falling so in love with this fabric line. There's more, but I think we'll stop with that! 2. How does your work differ from others of it's genre? This is really hard to answer, and judging from other blogger's responses, I think a lot of quilters would find this one tough. First of all, what is my genre? Other folks looking on could sooner answer this for me than myself. I sometimes feel that I don't have a 'voice', but rather bounce around, depending what I'm influenced by at the moment. Fairly simple in design, with a vintage feel and a touch of light hearted whimsy. 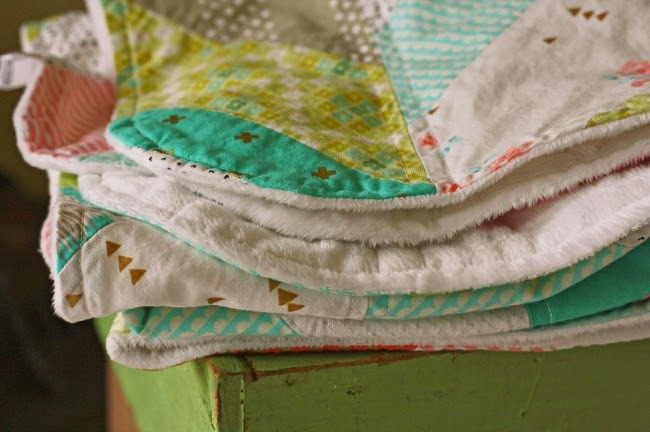 Quilts I'm drawn to are utilitarian in nature. Sometimes they are minimal in design, and sometimes packed with color and shape. Either way, they don't take themselves too seriously. Because my sanity depends on making pretty things. And I happened to work at a quilt shop when I was young. I love fabric, and have lots of it, and it needs to be put to use. And quilts are awesome. Honestly, this question makes me tired just reading it! And by the way, the photo above could be labeled, "How My Creative Process Does NOT Work"! Really I am quite haphazard. I think my best work happens when I have a mental inspiration or 'snapshot' of a quilt I want to make. I use this idea to guide my decisions as I create, albeit very loosely. Many of these ideas float in my head for weeks and I don't draw them out, which means they eventually fade. We hope it's the best ones that stick around though, and eventually are realized in a completed quilt! And that's all folks! Thanks for reading, or skimming or whatever! I rather enjoyed blathering on about myself for awhile. Since my adult self realizes that I have no obligation to continue the 'tagging' process, I will be true to form and not nominate any one in particular. I DO love reading your response to these questions though, so if you'd like to answer them on your own blog, please do so and send me a link because I want to read it. Or if you don't have a blog, you could email me your answers anyway! I never get too much 'quilt talk'. I did my post for the blog hop this week and mentioned it was like a blog chain letter. Your creative process is similar to mine, as it resides primarily in my mind. 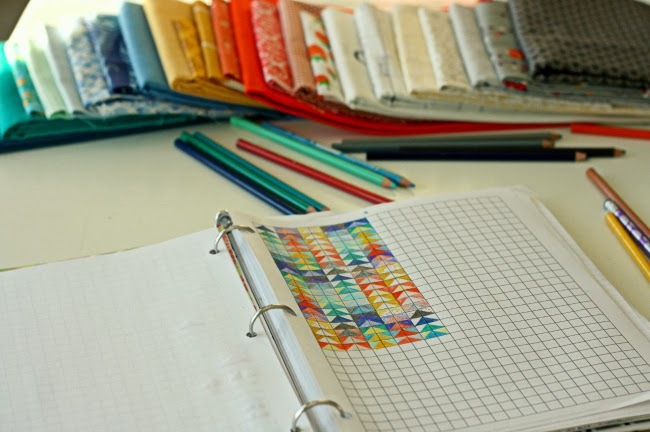 I notice others using colored pencils and graph paper to plan out quilts, so I decided to try it once and it definitely wasn't for me. I found when I had a newborn I did a lot of hand stitching as I could do that fairly easily while he slept on me. Those little moments of stolen sewing time are some of my favourite moments from that time, it was like he and I were working on something together. Loved reading your answers. I'm the same with inspiration - it comes in waves. I'm only now starting to think about using and creating my own patterns and I'm finding that a totally new experience (and pressure) as well. Such a fun adventure though. Your post was fun to read! I participated in the Around the World Blog Hop, but didn't tag anyone either. I was feeling stressed out about it, and then I decided that my quilting and blogging are for fun, so the stress wasn't worth it! I love your quilts! They always inspire me! i am so impressed that you are taking time to sew with your little one! good for you for sneaking in a little bit of creative time. enjoy your babe! What makes you different.... I think, is the use of fabric. You take chances and they work. Love your work! I am dying to see what you did with that bundle.......dying I tell ya! I don't like quilts (or people in general) who take themselves too seriously. :D Maybe that's why I love yours so much! 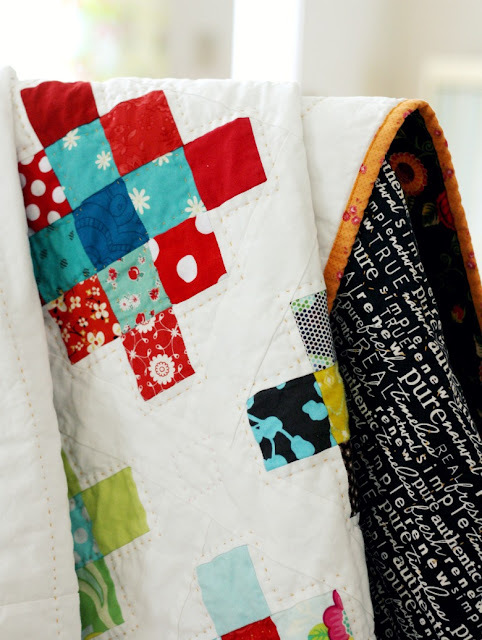 I love the idea of using soft fabric at the inside of your quilt! What a beautiful blog! I really enjoyed reading this. I enjoy reading everything you write, and of course seeing every single thing you make. I didn't tag either, in fact my post was the around the world dead end LOL When 2yo OWB was a babe I sat and hand stitched while wee snuggled it is one of my most blissful memories....especially once the mastitis passed aaaagh.